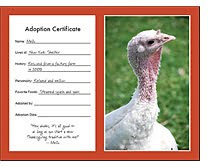 Adopt a Turkey This Thanksgiving instead of Eating one! We have been supporting the Farm Sanctuary since visiting the Watkins Glen Farm in 2007. Last year we had our first official Turkey Free/Animal food free thanksgiving. (Previously my parents were bringing their own turkey). This year we are starting a new tradition and will be adopting a Turkey from the Farm Sanctuary in celebration of our 2nd Vegan Thanksgiving. I think it's important for our kids to see what the living bird looks like instead of the dead bird they are accustomed to seeing on the Thanksgiving table. They are beautiful, gentle birds. There seems to be a disconnect when the only thing kids and adults see is the "end product". I won't go into detail about how Factory Farmed Turkeys are raised and taken to slaughter. You can read about it and watch a video on the Farm Sanctuary website. The birds, organic or conventional, are very different from their wild relatives. I hope my posting this information will mean at least one less Turkey being served this Thanksgiving.